Since the Austro-Hungarian war records were mostly destroyed at the end of WWI, there seemed little hope of tracing my paternal grandfather, who died somewhere during the war, serving in the army, according to my father. He only mentioned this once (at least to me) and I interrupted him in the story, I was so surprised. So he never continued. Mea culpa. The remaining war records are stored in Prague and can be searched here. I assumed that they only would contain information on Czech regiments so I had never bothered to search until a few days ago. As usual I plugged in the two surnames my father was known by: Kosmyryk and Suknowicz, expecting nothing. To my surprise Kosmyryk appeared twice in the search. Now this name, the one I grew up with, has never been found by Google, (not counting me, my two sisters and this blog) or on any genealogical search. So we assumed it was a made up name or a badly transliterated Cyrillic name. The story of why my father changed from Suknowicz to Kosmyryk has two versions but attempts trace the documents adopted by my father backwards in time have always failed to produce anything. Stefan Kosmyryk was listed as wounded on 8 October 1915 and then died on 30 November 1915. He was born in 1889 in the town of Pniow, in the Nadworno district of Galicia. Stefan was serving in infantry regiment 15 in the 12th company. So it seems Nadworno is not far from Stanislau (Stanislawov, Ivano-Frankovsk). So who is Stefan? A brother of Mikhail, the supposed grandfather's name? Or have the Suknowicz and Kosmyryk families merged their histories in my father's mind. Another puzzle: where was he injured? The Eastern Front in 1915 in the Carpathians seems to have ended in September. Too bad to be injured after the end of the campaign season. But it seems that the 15 th Infantry regiment was not stationed near its home and doesn't seem to have been fighting on the local front. I'm having a lot of fun with iPhoto. Its "Names" feature is really cool. If you attach a name to a face it ploughs through your photos finding matching faces. It manages to find all the family likenesses at different ages, so it matches my older self with my childhood photos. It also managed to match my father's photos under his prewar name with his postwar name, sort of confirming that the prewar photos were really him. On the other hand it makes some hilarious mismatches, some of which are only funny if you know the people concerned. Also if you pick an individual photo, it will try and guess who the people are, which can also be quite funny. It pulls names out of your address book which saves a lot of typing and misspelling as well. On the other hand it can't recognise a cat face. Colonel Sanders of KFC fame ??? one face from a memorial to the Decembrists, at a station on the Trans-Siberian railway. When Sloph went off to Moscow to learn Russian for three months, we told her we expected a blog. So far we have had a regularish newsletter which has been hilarious as well as informative. Now she is complaining that nobody answers it. She only told me just now that she has posted the newsletters on a blog, Notes on Moscow, so now I can hopefully pass this on and she can get some comments, for encouragement. for many weeks when i was first here, i thought that russian men were simply very chivalrous and carried their girlfriends handbags for them. as the weeks went on though, i started to notice that men were carrying these bags regardless of whether there was a woman with them or not, and that in restaurants they dipped into them for their wallets and mobiles, forcing me to come to the realisation that they were in fact the man's own bag. 6. under no circumstances are any of the manbags described above viewed as remotely gay, and if one were to suggest as such to the wearer, this would probably provoke a fight. This seems to be a subject Carpetblogger should pronounce on, as she is the expert on Russian style and dyevotchkas. My second building project was (you saw this coming) another massive housing scheme in the form of three terraces. Built in the innovative London Borough of Camden, it has had a different fate. Known as Alexandra Road when we built it, it now goes by the name of Rowley Way. You can see that the white concrete has weathered to grey (oh the tantrums from the architect when the concrete came out slightly pink). The long, crescent-shaped site is bounded on the south by existing housing, major streets on the east and west and has continuous frontage along the railroad to the north. The desire to control the sound and vibration from the trains was a major consideration in the organization of three parallel rows of dwellings. * Two rows of terraced apartments are aligned along the tracks with the higher 8 story stepped building designed to block the noise of the trains from reaching the interior portion of the site. A lower, 4-story block runs along the other side of a continuous public walkway that serves both terraced rows of buildings. These buildings are designed to open to the south. The third row of building, along the southern edge of the site, parallels another public walkway between this row and the existing earlier buildings of the Ainsworth Estate and defines an open public park between the second and third row of dwellings. A community center that includes a school, reception center, maintenance facilities and the heating plant*** mark the entrance to the site from London Road to the west and open to the park areas. The lower buildings contain maisonettes with shared access, terraces, and gardens. Maisonettes also occupy the top two levels of the large slab with entrance from a continuous gallery at the 7th floor. The dwellings in the lower floors in this block are flats that are entered from open stairs serving two dwellings per floor. Parking is located beneath the building along the tracks. Poured-in-place concrete is used throughout. Alexandra road received much criticism during and after construction because of enormous cost overruns caused by the complicated construction, unforeseen foundation problems and inflation**. Notes taken from here. * You can see this housing block as you come into London's Euston Station as it leans back towards the railway. The block nearest the railway is built on rubber pads to remove the vibration. The blocks had something like a 50 year life so I wonder what will happen then, when they fail. ***and a famous exploding sewer. The contractor had to build over the sewer which was in danger of collapsing. It was my job to make an annual walk-through inspection to see whether it was getting worse. Victorian brick sewers are rather interesting to visit. One day there was a freak thunderstorm. It just happened to be the day the contractor had excavated round the sewer. The pressure of the water coming down from Hampstead blew off the top of the sewer and flooded the site. That took quite a time to fix as well. The building is much admired by (mostly foreign) architects and students make pilgrimages to look at it. I think it is already a protected architectural monument. Articles like "Alexandra Road: the last great social housing project", (Freear, Andrew, AA files, Sept, 1993, pp. 35-46) are written about it. I haven't been back for a long time and have always been faintly embarrassed by my association with another of these big concrete blocks. In the early 1970's I used to use Alexander Road as a short cut from Kilburn to Swiss Cottage and remember wondering how the unfortunate people living in those imposing but decrepit Victorian mansions survived the winters. They weren't wealthy enough to seal up the windows, how did they manage to heat their huge homes? Ten years later, my council lottery number came up and Rowley Way was one of the offers. I was amazed to see what the council had done with Alexander Road. By now I had two toddlers and another baby on the way, so my choice was heavily influenced by this fact.I had turned down two other apparently much more desirable flats on the grounds that they did not meet my most basic requirements: safety for the children, personal comfort, freedom and adequate privacy. I was looking for a home that didn't imprison; where we could sit outside without leaving home; I needed to feel my children were safe being outdoors, walking to the shops unaccompanied for instance. I was also keen not to be isolated, as so often happens to young mothers, and yearned to be part of a vibrant mixed community. Being a "foreigner", I was not constrained by classic English snobberies and preconceptions about public housing and viewed the estate with an open mind. My first impression of Rowley Way remains vivid. The earthy red brick walk way and the dazzling white concrete structures had such a jolly Mediteranean feel. It was immediately possible to visualize it's potential as London's equivalent of the Hanging Gardens of Babylon. As soon as you turn off the busy Abbey Road into the estate, it is calm and quiet.This seems a rare luxury so close to central London. My 3 bed-roomed maisonette is flooded with light from every available source. Huge picture windows look out over a peaceful oasis of greenery and mature trees. Many a time I have sat and been simply uplifted by this lush view of nature or been stunned by the beauty of the sun burnishing the windows opposite with a copper glow. My utilitarian kitchen looks directly onto the brick walkway, which is particularly child friendly, and being pedestrian only (officially that is!) the children play safely there, within watching and shouting distance. Older children have the playgrounds, which are overlooked by everywhere, thus allowing one to join a community of women with children who effortlessly watch over each others offspring from the comfort of their own homes. I particularly love the simple clean lines of the flats; the sense of airy space despite their small size and low ceilings. I've seen interiors as diverse as Laura Ashley busy to Bauhaus austere, working equally well in these flats — they are well suited to transformation to personal taste. The walls are so thick that neighbors' noise rarely penetrates. One of the very best features, in my opinion, is the ingenious heating system, which, in the winter, is complete. No icy corners and draughty hallways, and no ugly radiators in sight. I think, ultimately, the genius of the design lies in the subtle way it supports family life, and a community spirit without forcing it down our throats. It's as easy to be part of the community as it is to stay aloof. For example, family units are constructed in such a way that only two families are forced, as it were, to be in extremely close proximity (sharing a basement stairwell, in our case). This makes it easier to deal with spatial conflicts. 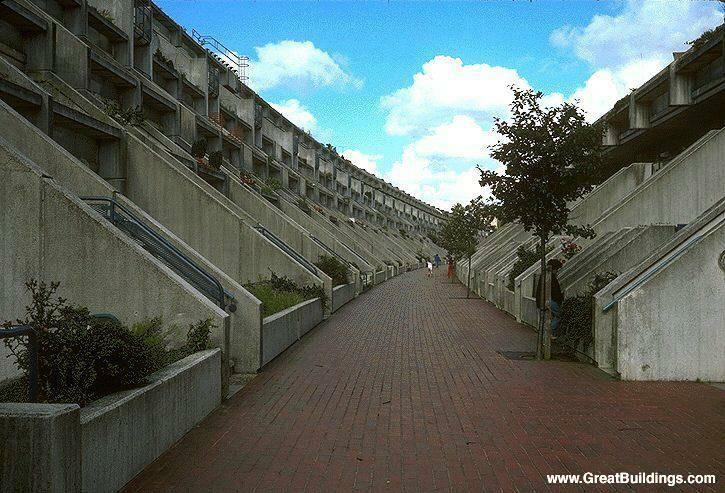 I've heard people comment on "how inhuman" Rowley Way appears to them. I can only say that my experiences in over 20 years of living in Rowley Way have mostly been positive and very human. Whether you've lived here for 20 years or 20 minutes, people are invariably friendly, polite and sensitive. I believe the space somehow magically engenders this. My closest neighbors and I enjoy mutual respect, naturally, perhaps because we're neither below nor above each other, but side by side, living in peace and harmony. For this I have always been grateful. But other people comment on the lack of maintenance and the heating failure, so not much to be proud about there. Interesting how two similar designs can have such different fates. I don't often bother to write about my past in the UK but after posting about the Georgian terraces here, I can't resist doing this bit of research on the buildings I built in the days when I was an junior engineer in the late 60s and early 70s. For my first job in London I was thrown in at the deep end. ; Armed with a maths degree and not much else I was sent off to Manchester once a month to sort out the problems on site on the largest housing estate in Europe in Hulme, Manchester. This was one of those nice concrete panel constructions beloved of socialist countries but built in large numbers in the UK as well. Back to back terrace slums were decanted (wonderful term for temporarily rehousing the occupants) and demolished to be replaced by the so-called horizontal streets in the sky, plus a few tower blocks. Altogether 1000 homes were built in four groups of what were fancifully called crescents modelled on the famous Georgian Royal Crescent in Bath. One was even called John Nash Crescent after the architect in Bath. At the time, the 'Crescents' won several design awards. It was a pretty surreal start to working life, bluffing my way through problems I had not much idea how to solve, but I developed a way of encouraging people to help me to find solutions, a skill I rely on very much nowadays. Another surreal part of the work was the site office in the middle of the mud and concrete. The so-called Zion Institute, a red brick building, housed the builders' offices, the Halle Orchestra rehearsals and a ballet school. As a result, girls in tutus mingled with workers in overalls and muddy boots, and I frequently shared the ladies loo with the harpist while she was practising. Tne of my first tasks during the construction was to help sort out the mess caused by the collapse of Ronan Point due to a gas explosion. One corner of this tower block in East London collapsed like a pack of cards, largely because it was built of concrete panels balanced on one another just like a pack of cards. As a result, the blocks in Hulme were being redesigned so the panels were at least tied together, and the heating was being changed to electricity instead of gas. This latter was a disaster. I had the job of checking the heating when the first group of tenants moved in. I had 30 tenants all with complaints about their heating. I had to do some vaguely scientific tests on the heating which showed that the design of the heating was undersized and too expensive to run. Most of the blocks built in this way developed mould and condensation as electricity became too expensive to heat them properly. The joints between the panels leaked. The "streets in the sky" became escape routes for vandals and hooligans who terrorised the inhabitants. Drug dealers and thugs took over the neighbourhood. Anyone who could get rehoused elsewhere did so, making the blocks housing of last resort for council tenants. Far from being architectural monuments like Georgian terraces, they looked like rather typical run down housing block in Soviet towns and must have been similar to live in. I was not hopeful of finding photos for reasons which will become apparent but in fact I found there is an ex-Hulme website here, from which I borrowed the following photos and where you can read the history of the area, and watch a TV video of the problems caused by this type of housing. In the late 60s it was the largest housing redevelopment in Europe when these crescents were built. By the 1990s it had to be demolished and the whole area regenerated again with low rise housing. Many blocks like these were demolished by controlled explosions, but there don't seem to be any photos for Hulme. and has survived two redevelopements. It's now an Arts Centre here. I am not sure whether I should be proud of my first building project or proud that it no longer exists. Been a bit lax on the book reviews lately, or got obsessed by Sudoku and its variants so haven't read much. This first is more of a preview than a review, since I just bought the book today, looking for a third for the 3 for the price of 2*. If you have ever read the posts on the side of this blog, you will know that my family history is a bit vague on my father's side but he seems to have come from Cernowitz, a town on the borders of Ukraine and Romania. 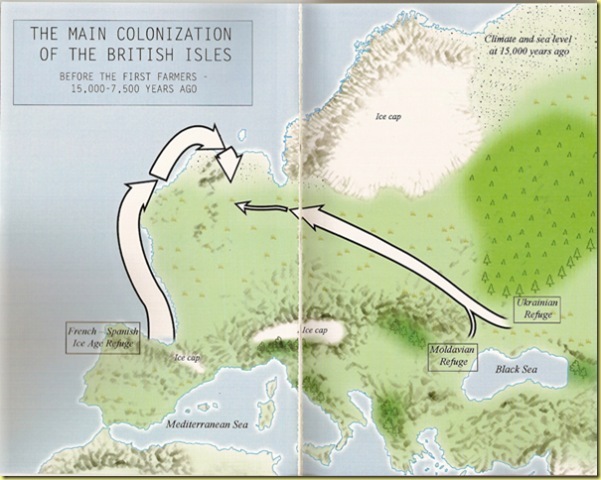 But when I picked up a book called the Origins of the British - A genetic detective story by Stephen Oppenheimer, I had no idea that this map would reveal that my British (or more accurately English and Welsh) mother also came from the same area! A few millenia before my father, it's true. Isn't it amazing what the study of genetics can do. No, I can't provide any more details, I need to read the book first. *the others were one of those nice Page Blank notebooks, with which I like to start a new project, and the new sequel to Chocolat, by Joanne Harris. I recently read Don't cry for me Aberystwyth by Malcolm Pryce, one of a series with titles like Last Tango in Aberystwyth, Aberystwyth Mon Amour, The Unbearable Lightness of Aberystwyth. They are detective stories in the film noir variety ( can you say that about a book?) with dialogue in the style of a local Raymond Chandler. I'm not sure how funny they are, if you don't know Aberystwyth, a small rather dour seaside town in Wales, with a university. Characters range from the local gym master, the donkey man and the icecream seller, plus the local druids. The plots are funny in a drole sort of way, if you know Aberystwyth. Actually I only went there two or three times, but it's very Welsh. The plots are pretty silly, but I quite like them. Much better is Berlin Noir, which has 3 books in one. In keeping with reviewing books when I feel like it, whether I have finished them or not, I am reviewing this when I have only got as far as half way through no 2. The books are by Philip Kerr who I had never heard of before, I didn't realise that there were 3 in 1 when I bought it, and I nearly didn't buy it at all, thinking it would be another spy novel - a poor imitation of Le Carre. And another, half recognised thought came, did I really want to read another novel about the second world war, hasn't it all been done to death already? I know, I know, I should be ashamed of myself. And I am really looking forward to reading the next Irene Nemirovsky when I find it. FIRST MAN: Have you noticed how the March Violets (people who joined the party later, jumping on the bandwagon) have managed to completely overtake Party veterans like you and me? SECOND MAN: You're right. Perhaps if Hitler had also waited a little before climbing on to the Nazi bandwagon he'd have become Fuhrer quicker too. By the end of the first book, the hero just gets to solve the crime, but only after a spell in Dachau (not I should add by choice) and a lucky break, while there. He seems to make quite a lot of money, but his girlfriend vanishes, (as do many people in the book) while he is chasing the villains, so there is no happy ending (yet). Definitely a good read and quite educational in a grim way, well removed from the typical British caricatures of the Gestapo and Nazi leaders. I originally started this blog thinking it would be about our family history, as we had just started trying to trace it again. It would also mean I could write it down for my kids. I thought I would write the story, the sisters would add comments, and it would be on the web for anyone who could fill in the gaps, to find. However, one of my sisters was not so keen to have some of the past available on the internet, so I had to stop. Now we have come to an agreement about what can be written and what not. This is my version of how I understand/remember it. My father's history is really what we are talking about, since my mother was half English and half Welsh and had a coherent story to tell us, with real relatives we actually met. The short story is that my father probably came from Czernowicz in the Bukovina which was in Austria before the First World War, became Cernauti in Romania between the wars, and is now called Chernovtsi and has been in Ukraine since the Second World War. My father never talked much about his past, his relatives, his childhood, the time before the war or what happened to him during the war. My mother always said that what she had heard was never the same each time, so she didn't know what to believe, and getting on with life after the war was more important. Anyway, we grew up thinking he was Polish, and we knew that he had lived in Brussels during the interwar period. After the war he came back to Brussels where he met my mother and soon they were married and I appeared (or perhaps it was the other way round). After a spell in Brazil, he came to England where he lived happily ever after (this is the short version!) with my mother and us three daughters, till he died in 1986. Then we could look at his papers, which he always hoarded, and try to make some sense of them, according to what he had also told us. My mother died five years later, so there wasn't much we could check with her afterwards. It was clear that he had some Jewish background, but the story shifted as to whether it was his mother or father that was Jewish. In the 1960s, he decided he was German and claimed German nationality. This seemed a bit contradictory, as one version of the wartime story said that he had been in Belsen. One sister claimed he told her that he had been in the Resistance. Certainly General de Gaulle was his hero. However by then we regarded all these versions as a bit like the Good Soldier Schweik's stories. Nevertheless, the German nationality seems to be correct as the document proving it has been checked by one of our friends who was the German Consul. But to claim German nationality you have to have documentation for two generations back, so we always wondered how he had managed to prove this. A further source of information was a long time friend in Brussels, who most of us had met, (my mother from the days of their courtship, my sisters from visits with my father). He confirmed some parts of the story and confused others. The confusion could have come from translations from French or his confusion through old age. At this point I rather gave up, being busy with my own first child. I just assumed that we would never get to the bottom of this story, and what did it really matter? The person who was my father was well-known to me, and what did it matter about his past. If there were problems in the war, who was I to judge, having had a much easier life? Obscure parts of Eastern Europe were inaccessible, and what could you learn when you had no names of relatives, and not a lot of certainty about where he came from? But when I started working in Ukraine in the 90s, after the breakup of the Soviet Union, I was at least able to go to Chernovtsi (photos on Flickr here) and see that where he was supposed to come from was not some shtetl, but had been a big flourishing cultural city with a large university, a Yiddish theatre and cemeteries indicating a multicultural world of Ukrainians, Poles, Hungarians, Jews, Romanians and Austrians as well as some Germans. The previously Polish town of Lviv (Austrian Lemberg) was not far from the previously Hungarian town of Mukachevo (Austrian Munkatsch), itself not far from the previously Romanian town of Chernovtsi (Austrian Czernowicz). All of them were large multicultural towns in the border country of the Carpathians. No wonder his nationality was not so clear. And no wonder he could apparently speak Polish, Romanian, Hungarian and Ukrainian when he arrived in Brussels. We decided that his mother tongue was German as it was apparent that he counted under his breath in German, though my parents first talked together in French. His papers got split up between the sisters and until recently no one had made much effort to assemble a coherent story (if there was one to be had). As the internet grows, more and more history is available and so from time to time we have all searched his name on genealogy websites, Jewish or German/Austrian, to see what had become available. But always nothing, even trying different spellings. ... to be continued as developments progress. A family debate has started about the consequences of writing family history online. What if the benefits of providing information (and collecting it as well) ends up exposing skeletons in the cupboard (if there are any) to people who don't know us, who randomly google us? Can this rebound? Has anyone any experience? My own feeling is that it is all too long ago for it to matter much to anyone, and it would be nice to have more information than we have at the moment. But not everybody agrees with me, so for the moment, this part of the blog is being made private. I hope we can keep it as a collection of stories reflecting how differently even members of the same family remember events. To me, a blog seems an ideal method to record these stories, with other members of the family either commenting or writing their own versions. The last thing I want is for it to become a sanitised non-history, because no one can agree. Assuming some of the story about my father's past is true, if he had stayed in the village, he would have been to Romania instead of Czechoslovakia and Hungary. If another part is true, it would have been Poland instead of Romania. This story comes from Judy Batt's paper Transcarpathia: Peripheral Region at the 'Centre of Europe'. That the research project is called "Fuzzy Statehood' and this requires a series of FAQs which can be found here shows that it is not just the maps that have fuzzy boundaries. However, there are those of us who know that the Centre of Europe is really in Lithuania. A diverse group of international artists have come to this 55ha sculpture park to express their own unique visions of the centre of Europe, which, according to the French National Geographic Institute, lays some 14km to the north of the place. Home to over 90 permanent sculptures by such global celebrities as Magdalena Abakanowicz, Dennis Oppenheim and Sol Le-Witt, everything is exhibited amidst a charming, some would say idyllic area of woodland. The year 2002 saw the park making it into the Guinness Book of Records as containing the largest sculpture in the world made from television sets (about 3,000, and including as its centrepiece a rapidly decaying concrete Lenin), the maze-like 'Info Tree' by Lithuanian visionary sculptor and founder of the park Gintaras Karosas. Here Karosas has found the perfect ‘place’ to construct his landscape artwork aptly labelled "The Place". Picture a pond, some boulders and four giant rusted steel poles in the midst of a plush green forest and you, basically, get the picture. The park also recently unveiled the playful sculpture of Mindaugas Tendziagolskis titled "Mobile Games". The construct incorporates art and ancient Lithuanian games and meant not to just be viewed, but also played. You can find their excellent website here. Though I don’t have much to say. I went to the trouble of getting a postal vote, though the Greek postal service did not deliver it in time. At least I assume so, as the Greek Easter and my heavy cold after arriving back from England, meant that I didn’t get to the office in time to pick up the papers. Also I was shocked that electoral fraud is now an issue in Britain as a result of making it easier to get a postal vote. I shall tease the people in my office about whether they were tempted to vote for me, if indeed the papers did arrive. One of the problems with postal votes for expats is that you can’t choose where you vote. I can see why that makes sense, as no doubt people could gang up and vote in marginal seats, or at least parties could campaign that way. However for me to vote in a rural constituency in the South West doesn’t make a lot of sense. The normal urban Tory/Labour standoff isn’t played out there, since there isn’t a large industrial work force to vote Labour, and traditionally the South West “establishment” tends to vote Liberal like in Scotland. Monmouth was always a place from which rebellions were launched, although these days it is thoroughly Tory. When I last lived there (1997) it was clear that tactical voting to keep the Tories out was what mattered so I voted Liberal. When we lived in Brecon, the boundary was gerrymandered several times so it became a very marginal seat. There too I voted Liberal since the incumbent Liberal MP was working hard and was very visible, even appearing at the village agricultural show, though there must have been several every weekend he had to get round in the summer. When we first bought our house, the constituency was a Tory stronghold, which seemed strange given it was so close to the coal-mining Valleys. I remember being visibly shocked when before election time, the candidate’s wife arrived in the local pub and bought everyone a beer. And they all drank it and there was almost an invisible forelock being tugged in thanks. I was only marginally reassured when Gwyn MM (because he had seen the world, winning the Military Medal somewhere in the African desert and therefore was a bit more outspoken than the rest) gave her a V sign of the wrong sort as she left, indicating that the beer was accepted without any obligation. But it gave the impression of what might have happened in the 30s when the local mine owner might have done the rounds to get the vote out in his favour. But apart from 1997 (and everyone still remembers Portillo’s face on his defeat) elections have had little excitement now that the result is known so quickly. Only the fanciness of the computer graphics advancing in proportion to Peter Snow’s age and Antony Howard’s pomposity vary from one election to the next. It’s a long way from student days in London in the 60s when even then, the result was known by midnight in Trafalgar Square and you could all go home and drown you sorrows. I suppose these days party affiliations are no longer so tribal, in that they followed the way your family had always voted. My mother introduced me to the all night waiting up to hear the results over the radio, carefully taking out the Guardian supplement with the constituency lists which could be crossed off one by one as they came in. In time the strange names of constituencies (Liverpool Toxteth, South Fylde) became familiar to me in the same way as football team names from the football results on the Saturday radio (Hamilton Academicals, Arsenal) and the strange list of places round the British coast which were relayed on the Shipping Forecast (Dogger Bight, Finistere…). My father would retire to bed, ready to sneer in the morning no matter who got in. He would have only voted for a Gaullist candidate and had no faith at all in Labour, having lost all his socialist beliefs by the 50s. In any case, he didn’t have a vote. However, his long explanations of French politics, including an early hatred of Mitterrand (which always produced a sneer and a curl of the lips) meant I had a similar long list of French politicians in my head long before it was necessary to understand EU (and hence French and German) politics. I suspect he had a sneaking respect for Margaret Thatcher as a strong leader though I don’t remember hearing him say anything about her politics. He was Gaullist in his approach to immigrants, seeing French colonial struggles in North Africa as the correct attitude towards the increasing numbers of Pakistanis coming to work in Preston at the time. Though I didn’t know any Pakistanis myself, his racist remarks were unpleasant. My mother was an active member of the Labour Party (they sent someone to her funeral!) in a Tory stronghold. She enjoyed putting up posters in the local Church Hall advertising “You have heard Goliath, now come and hear David”. At a Tory meeting she complained they were using the Union Jack for a table cloth and shamed them into removing it. I remember being taken to hear Harold Wilson speak in Preston, in 1964, when both seats were marginal. He was heckled because the government had just cancelled the TSR2 aeroplane (a defence contract at English Electric, now part of BAC) causing huge job losses. However the workers were counterheckled by all those who had lost their jobs already when the cotton mills had closed in the 50s and at British Leyland in the 60s as part of the downward spiral of the British car industry. So no one really had much sympathy locally for these highly skilled (I suppose also highly paid) workers who were now out of a job. I remember having to calm my mother down as she was shouting at someone who was actually agreeing with her. This was all a different world from the grammar school debates which were allowed to happen just before the election. There I was the only Labour voter, and the debates were conducted without any serious preparation or discussion of what elections were for. Needless to say, the tribal voting meant the Tories got in whatever the country voted for. This only reinforced my sense of isolation. I think my mother always hoped I would go into politics. I suppose there is still time.